If you’re looking for some entertainment this Bank Holiday weekend, you’ll be pleased to hear that five new films are due for release in UK cinemas this coming Friday. 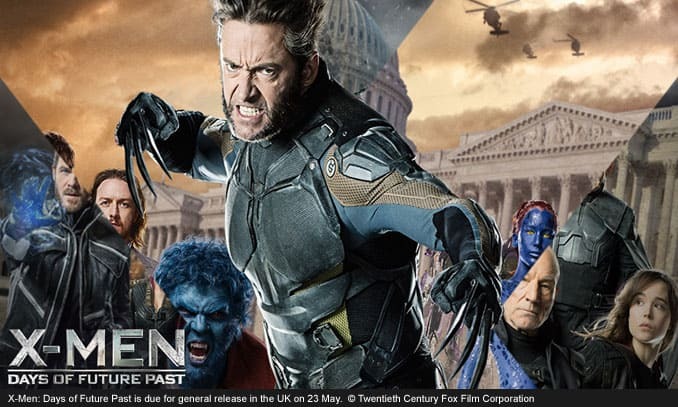 The eagerly awaited sequel X-Men: Days of Future Past hits UK cinemas on 23 May. Hugh Jackman returns as Wolverine and is sent back to the past in a desperate effort to change history. Characters from the original X-Men trilogy and X-Men: First Class join forces in the ultimate battle to save the future – for both mutants and humans. X Men: Days of Future Past is the seventh film in the popular American superhero series and is rumoured to be Hugh Jackman’s last appearance as Wolverine. Adam Sandler and Drew Barrymore reunite on screen for the third time in Blended, a romantic comedy directed by Frank Coraci and due for release on 23 May. After a disastrous blind date, Jim (Sandler) and Lauren (Barrymore) find themselves stuck together at a family holiday resort. Cue plenty of silly jokes, goofball routines and a few emotional moments. If you’re looking for charming rom-com to pass the time away, Blended is the movie for you. In his fifth film as a director, John Turturro stars alongside Woody Allen in Fading Gigolo, an American comedy due for release in the UK on 23 May. In attempt to make money for his cash-strapped friend, Fioravante (Turturro) decides to become a professional Don Juan. With Murray (Allen) acting as his “manager”, the duo quickly find themselves caught up in the crosscurrents of love and money. Despite mixed reviews from the press, Allen and Turturro make a wonderful double act in Fading Gigolo. Sharon Stone also stars as a horny Manhattan housewife. If you’re looking for something to keep the kids occupied, check out Legends of Oz: Dorothy’s Return, an animated family musical due out on 23 May. To save her old friends the Scarecrow, the Lion and the Tin Man from a devious new villain, Dorothy heads back to Oz to restore order and happiness to Emerald City. A few new characters also tag along for the ride including Wiser the owl, Marshal Mallow, China Princess and Tugg the tugboat. Everyone’s favourite postman also makes a return to our screens this month in Postman Pat: The Movie, a new animated film due for release on 23 May. Determined to take his wife on holiday, Pat (Stephen Mangan) enters a national talent contest to raise some funds. However, while the veteran postman copes with his newfound fame, his job in Greendale is under threat with the introduction of robot postmen. Postman Pat: The Movie stars the voices as Stephen Mangan, Rupert Grint and Jim Broadbent. Boyzone’s Ronan Keating also lends his vocal talents to the film as Pat’s singing voice. Whatever you decide to watch this Bank Holiday weekend, don’t forget to let us know what you thought of it in the comments section below.